- NZD to hit decade-long low against USD in 2019 says ANZ. - As RBNZ courts inflation by cutting rates to new record lows. - Pound-to-Kiwi rate forecast to rise almost 5% before year is out. The New Zealand Dollar will fall to its lowest level in more than a decade this year, according to the latest forecasts from Australia & New Zealand Banking Group (ANZ), while the Pound-to-New Zealand Dollar rate is forecast to rise almost 5%. New Zealand’s Dollar will be jettisoned from the portfolios of investors after the Reserve Bank of New Zealand (RBNZ) is forced to cut its interest rate to a fresh record low before the year is out, according to the analysts at the Kiwi lender. Rate cuts will come after the economy slows further during the first half, weakening New Zealand’s fragile inflation pressures and driving attainment of the upper band of the RBNZ’s 1%-to-3% inflation target even further off into the distance. "The RBNZ adopted a cautious, neutral tone in November but continues to signal rate hikes in the future. In contrast, we now see the OCR as more likely to be cut, with the first move pencilled in for November this year," says Liz Kendall, an economist at ANZ, in a recent note to clients. Above: ANZ Research forecasts for New Zealand economy. New Zealand's economy grew at its slowest quarterly pace for three years during the third-quarter according to official data, with the annualised rate of growth falling from 3.2% to 2.6%, which was beneath the forecast of the RBNZ for this time period. Interest rate derivative markets show investors are betting a near-50% chance the RBNZ will cut its cash rate to a fresh record low of 1.5% before February 2020. The market-implied interest rate for that month was 1.68% on Tuesday, around half a rate step below the current 1.75% level. Kiwi inflation has been beneath the midpoint of the RBNZ target for almost four years, prompting the bank to keep its interest rate at a record low of 1.75% for more than two years. And now both the global and New Zealand economies are slowing, which means even less inflation pressure in the future. Changes in interest rates are only normally made in response to movements in inflation but impact currencies because of the push and pull influence they have on international capital flows and their allure for speculators. "It’s unlikely to be a smooth path for interest rates between now and an eventual cut. Market pricing is likely to continue to ebb and flow, and we wouldn’t be surprised to see the data cause some volatility in the interim," Kendall warns. Kendall says an RBNZ rate cut could come before November if the global economic environment deteriorates quickly enough. Signs of weakness in the domestic economy could also prompt the bank to take action. And both are possible given the ongoing U.S.-China trade war. As global and domestic economic data pour in over the coming months, markets will adapt their view of the likely strength of New Zealand's inflation pressures up ahead as well as the odds of an RBNZ cut being delivered any time soon. Movements in the market-implied cash rate will be what influences the Kiwi currency the most up ahead. And that rate will itself be driven by the ebb and flow of the signals given off by New Zealand’s economic data. Above: NZD/USD rate shown at monthly intervals. Captures last visit to the 0.61 threshold. The RBNZ's plans for regulatory capital buffers in the domestic banking sector will be important for both the economic and interest rate outlooks too, given the bank said in December it could require lenders to build considerable additional buffers. That would reduce the amount of capital available for lending to Kiwi companies and consumers as a minimum. It could also lead to higher mortgage costs for households, which would merely serve to darken the outlook for consumer spending and inflation even further. “Our view that the OCR will need to move lower is consistent with our medium-term downward bias for kiwi. Prices for New Zealand’s commodity exports (long a bastion of support for the NZD) are also past their peak, pointing to a weaker outlook for the terms of trade,” Kendall says. 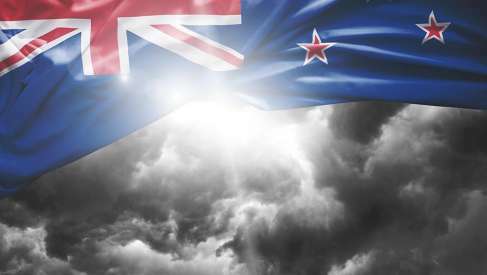 Kendall and the ANZ team forecast the NZD/USD rate will fall to 0.61 before the curtain closes on 2019, from 0.68 Wednesday, which would mark the exchange rate's lowest level since the first quarter of 2009. They project the Pound-to-New-Zealand-Dollar rate will rise from 1.91 to 2.02 at the same time, implying 4.7% upside for the exchange rate this year.